Coconut oil is the new “thing”, but is it really as great as everyone claims that it is? 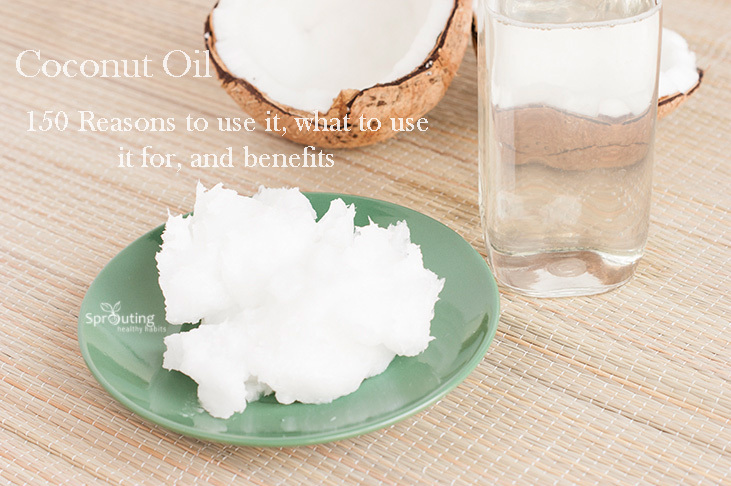 There is a lot of research surfacing that is related to coconut oil but what does it all say? For a few years now I have been using coconut oil in place of other oils or products ALL over my house. I knew there was good things to say about it and I loved using it. I won’t lie I was a skeptic when it came to some of the uses I heard about, but to my surprise they might just be true. Over the years I’ve learned more about different uses and benefits but it wasn’t until I started putting together this post that I learned way more than I bargained for (in a great way of course). Coconut oil has been used for centuries around the world and I hope that more studies are done in the future on this wonderful fruit. The dirt on Coconut oil…. As many great coconut oil ideas, uses, and benefits that are talked about, there is an equal number of bad articles or insights from people. Yes, Coconut oil is made up of saturated fat (the “rumors” are true) but before you gasp and run to throw your jar in the trash, read a little more. There are 3 different types of fat; saturated, monounsaturated , and polyunsaturated and all oils & fats contain all 3. Coconut oil contains mostly saturated fat but the type of saturated fat it holds is way different from the “bad” saturated fats we are used to hearing about. We have been told that saturated fats are all bad but this is far from the truth. Dr. Mercola has a pretty good article on the types of fats if you wish to educate yourself more. Medium Chain Fatty Acids (MCFA’s) are different than the long chain fatty acids because they are converted into energy by your liver rather than being stored as fat. When we normally eat fat/oils, they are broken down and converted to lipoproteins which are then sent to the bloodstream and deposited into our fat cells. Then the carbs and proteins are used up for bodily functions and activities. Anything left over gets stored. Yet, Medium Chain Fatty Acids don’t end up in the blood stream to be stored for later. They go right to the liver and are then converted into energy, giving your entire metabolism a boost for up to 24 hours. I am also told that they do not raise blood sugar levels which may have been a concern for some. Medium Chain Fatty Acids are found in mothers milk and are added to baby formulas to provide nutrients and protect infants from harmful germs. They are one of the healthiest types of fat and fat is required by our bodies to function. Coconut oil contains the most concentrated natural source of medium chain fatty acids and this is why it is SO beneficial and can be used for hundreds of different things and provide us with numerous benefits. Before you read on….I want you to be fully aware that I am not a doctor or medical professional nor am I a scientist of any kind and I do not pretend to be any of those. The information provided in this post and any article on Sprouting Healthy Habits is for entertainment purposes and to help encourage others to do their own research and speak with their doctor or medical provider before making any adjustments or changes to their lifestyle. The information below was gathered from books and articles from doctors and medical professionals but by no means should it apply to you unless a doctor physically recommends it to you (sources will be listed at the bottom). Sprouting Healthy Habits and authors are in no way responsible for any choices or changes you make in your lifestyle due to information you have read on Sprouting Healthy Habit’s website or any other related sites or pages. Sprouting Healthy Habits is not responsible for any household changes or damages that may occur due to choices you have made to experiment with anything you have read on this site or others associated with Sprouting Healthy Habits and its authors. Read full disclaimer here. Coconut oil is an excellent replacement to all cooking oils. When we buy most organic unrefined cold pressed oils, the properties of the oil can be destroyed when cooking. Coconut oil has a higher smoke point than most other oils and doesn’t wreck havoc in your body like other oils used in cooking can after cooking. It makes a great supplement to your diet so switching out cooking oils for coconut oil has huge benefits. Here are some ways you can add it to your diet. 10. Add coconut oil to homemade protein balls or bars. If you know of any other benefits or uses for coconut oil make sure to comment bellow. I hope this encourages you to consider adding some more coconut oil to your life and make sure to follow sprouting healthy habits on twitter for more interesting tips.